The type of party you are heading for has a direct relation with the jewelries that you are going to adorn yourself with for instance if you are invited for a formal party then the jewelry combination has to be elegant with a flair of formality. 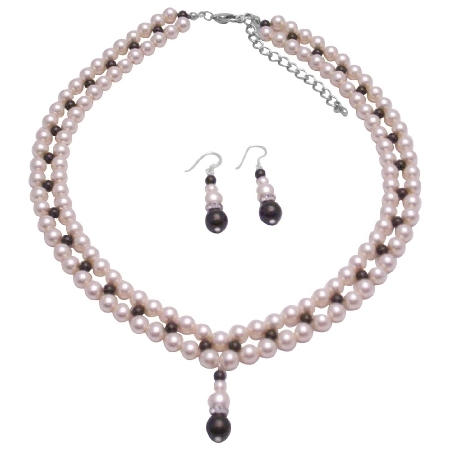 Swarovski Ivory Pearls with Darkest Chocolate interwoven between two stranded of Ivory Pearls. Customize this jewelry as Bridal Bridesmaid Prom Mother Of Groom & Bride in Swarovski Pearls in your color. Three Stranded First & bottom strand with Ivory Pearls & middle strand with brown Pearls hand-matched & hand strung; the Necklace is The ultimate layering piece or bold & beautiful on its own you must-have this.